Self-similarity and the orderly crystal (often dendritic) growth are an important parts of nature as well as the source of solid-state thermal chemistry under nonequilibrium (undercooling) conditions providing theoretical roots of chemical swinging clock. Such oscillation processes known in chemistry and biology apply for systems far from equilibrium involving special cases of oscillations extending from the self-organized periodic chemical reactions (such as Liesegang’s or Belousov–Zhabotinsky’s reactions) to ordered solid-state processes, from liquids to atmosphere, from macro to micro, indispensable in biology. 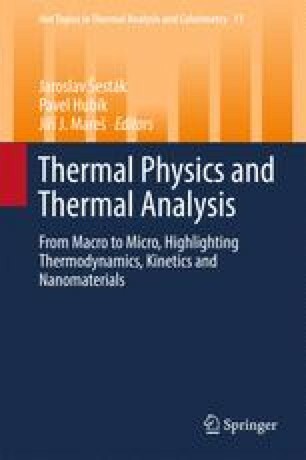 The chapter deals with a remarkable problem of thermal physics, unresolved for more than 70 years, concerning class of diffusion-controlled periodic chemical reactions, where macroscopically observed diffusion action attains, with appreciable accuracy, the value of Planck’s quantum. Because the classical and quantum diffusions are processes, which are indistinguishable in the configuration space, a quantum criterion in terms of diffusion constants is valid. This criterion enables one to find out conditions under which the quantum behaviour of self-organized periodic reactions can be observed. Examples are shown for the subcritical and critical oscillatory regimes; a special kind of self-organized Liesegang’s rings—annual growth rings of a trunk of larch tree is discussed. The text even involves a thinkable hypothesis of the light self-organization based on the previously analysed principle on least time (Fermat) and of the least action (Maupertuis). It was already noticed by Galileo who opened this problem aware that the cycloid curve yields the quickest descent leading to the so-called brachistochrone. The chapter contains 130 references. The results were developed and the book realized thanks to the resources made available by the financial support of the CENTEM project, reg. no. CZ.1.05/2.1.00/03.0088, jointly funded by the ERDF (within the OP RDI program of the Czech Ministry of Education, Youth and Sports).